In this video we demonstrate a method of stretching the quadriceps that not only stretches the quads, but your hip flexors as well. What most people don’t realize is that the hips must be put into flexion in order for the stretch to be effective. Without putting the hips in flexion, the rectus femoris won’t be targeted leaving you with only 3 of the 4 quadriceps being stretched. The method we demonstrate in this video, will show you an easy way to target all of your quads, and it can work quite effectively with the PNF method of stretching demonstrated in a previous video. Whether you’re someone who is struggling with your flexibility or you just want to bring your flexibility to the next level, PNF (Proprioceptive Neuromuscular Facilitation) stretching may be just what you need. When compared to other methods of stretching, PNF stretching is one of the most effective ways to enhance your flexibility in a short period of time. This advanced method of stretching, which was originally designed as a form of physical rehabilitation, involves both a stretching and a contraction phase of the muscles being targeted. As a result of its multiphase approach, PNF stretching will not only help you to increase your flexibility but strength as well. 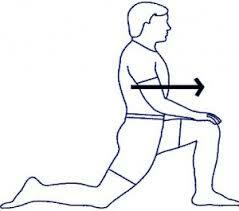 In this article we’re going to look at a couple methods of performing PNF stretching. Please be sure to always “warm up” before performing any stretching exercises. PNF stretching is a fairly easy to understand method of stretching which involves a 3 phase approach. Phase 1: Bring the muscle group being targeted to maximum flexibility, hold the static stretch for approximately 30 seconds. One of the best ways to do this is through the aid of a partner who can help to bring you into your maximum stretch, in the absence of a partner you may use a towel, rope, or other piece of equipment. Phase 2: Involves bringing the muscle group being targeted under tension by pushing against your partner or whatever piece of equipment you are using to help perform your stretch. (With some stretches it’s actually possible to supply tension by pushing against your own body) This phase should be held for 5-8 seconds, with the body part being stretched remaining completely still. Phase 3: Upon completion of phase 2, you should now find your flexibility enhanced and thus reposition the muscle group being targeted to the point of maximum flexibility for 1 more static stretch which you hold for another 30 seconds. You may repeat the three phases for multiple sets if you’d like. Also be aware, there is an alternate method to phase 2, in which you bring the muscle being stretched under tension through the use of a concentric contraction. This means resistance is applied while the body part being stretched moves through a range of motion. For a better understanding of how to perform PNF stretching please take the time to view the video below. Enhance your Training with Mental Practice! Start Developing Your Core in Under 5 Minutes!!! In our first video of 2014, my leadership team and I take you through a very quick yet very effective core workout. This is one of the many workouts we do in our classes on a regular basis, and it’s one that can easily be done at home! We encourage you to follow along as we go through the workout. It will only take 4.5 minutes of your time, and it is certain to aid in developing and toning your core! These 4.5 minutes could be the first to better fitness and health in 2014!